When Diane Hutchinson watches videos of last year's horrific mass shooting in Las Vegas, her stomach tightens and she feels like throwing up. Her ears ring and she breaks out in sweat. She starts to cry uncontrollably until she can't breathe. "I would listen to videos with my eyes closed. It was hard to watch," Hutchinson, from British Columbia, Canada, told CBS News. When she finally watched with her eyes open, "a piece of my soul died." Hutchinson is among the thousands of survivors of the shooting who are struggling with an unprecedented form of trauma: She survived not only the deadliest mass shooting in U.S. history, but also the most widely recorded. 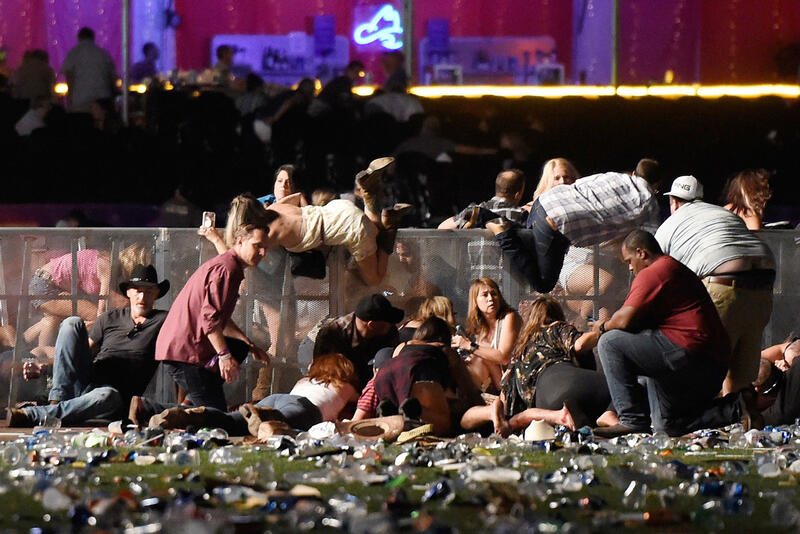 The rampage on Oct. 1, 2017 — in which 58 people were killed and more than 800 injured — happened at an outdoor country music festival with a crowd of more than 22,000 people on the Las Vegas Strip. One year later, hundreds of videos from the shooting are easily accessible online, including police body cam footage, surveillance videos, cellphone clips and social media posts from terrified concertgoers. Many of the videos show victims being shot or lying dead on the festival grounds as thousands of panicked patrons flee. No other mass shooting has been depicted in so many publicly available videos, and the exhaustive footage is a roadblock on some survivors' road to recovery. Some have found themselves unable to stop watching the videos. Others endured online harassment after users started forensically analyzing the videos for evidence of unsubstantiated conspiracy theories. There are YouTube accounts devoted to collecting Las Vegas shooting footage, and despite the platform's policies against certain depictions of actual violence, new videos still appear every few days. The shooting seems destined to live online as a horror that can be relived from all angles with just a few clicks. Over the course of about 10 minutes, 64-year-old gunman Stephen Paddock rained more than 1,100 bullets down on the crowd below from his suite on the 32nd floor of the Mandalay Bay resort and casino. He shot and killed himself before police breached his room. Hutchison, the survivor, said she and her boyfriend played dead during the shooting, since they couldn't tell where the bullets were coming from. They waited 45 minutes before escaping the venue of the Route 91 Harvest Festival. She was "obsessed" with watching videos of the attack when she returned home after the attack. At times, the clips were helpful as she tried to make sense of the chaos of that night. "Watching the videos helped me to gain perspective on what other people's experience may have been like," she said. But other times, especially as the first anniversary approached, it only hurt. "Sometimes I watch to remind myself what I survived," she said. "Sometimes I watch because I feel dead inside and want to go back to that night to see if I can come back to life. Sometimes I watch just to feel the pain so I'm know I'm still alive." Mike Cronk, a survivor from Tok, Alaska, said he has done his best to avoid the videos. "I know what I went through, I know what happened ... I want to move on," he told CBS News. But they still became a part of his life. He's seen one video that was filmed right after one of his friends was shot and wounded, and the sounds of the gunshots bring him back to that moment. He's watched others where he recognizes people he saw during the three-day festival who ended up getting killed. "It wasn't fair that I had to deal with that," Cronk said about the conspiracy theory videos. He struggles with his feelings about so many of the videos remaining online. "I don't know how to limit that," he said. "Freedoms are freedoms, but boy, there sure comes a time when you wonder if stuff like that should be on there." YouTube's policies about videos showing real-world violence allow for some content that is "balanced with additional context and information." Some Las Vegas shooting footage appeared in news coverage, but the bulk of it — including graphic videos of victims being shot — lives on independent accounts, some of which are devoted to spreading conspiracy theories about what happened. YouTube, which is owned by Google, did not directly address questions from CBS News about the videos. The company said in a statement, "YouTube has clear policies that outline what content is acceptable to post. We quickly remove videos violating these policies when flagged by our users, and we allow videos posted with a news, educational or documentary purpose to remain on YouTube." One year since the shooting, newly unearthed shooting videos still pop up online. A YouTube account called "Las Vegas Shooting Archive" is the most comprehensive collection, with nearly 600 videos depicting or related to the shooting. The account is run by a Las Vegas resident who identified himself as S. Ramirez and said he was not at the concert. He told CBS News he became so fixated on investigating the shooting that his girlfriend stipulated he couldn't talk about it on weekends. Ramirez said he is constantly finding new footage through social media, direct tips and picking up batches of body cam videos released by the Las Vegas Police Department. He said that more survivors have reached a point where they feel comfortable sharing their own footage from that night, and he estimates that hundreds of additional videos will one day appear on the internet. Ramirez said he has avoided posting the most violent videos he obtained, and he started the channel "almost accepting the fact that it would be removed at some point in time." But he said he has had "no interaction" with YouTube employees since setting up the account nearly 10 months ago. He said he has heard from survivors, and that most of them have "completely endorsed" his efforts to show people the enormity of the tragedy. If someone complained about his collection of videos, he said he would direct them to the survivors "who have stepped in for me and said, 'This is not traumatizing for me personally, this is helping me.'" "Everybody mourns differently," he said.